I am starting to ride my bike more and want an easy way to carry it and my wife's bike on the van. 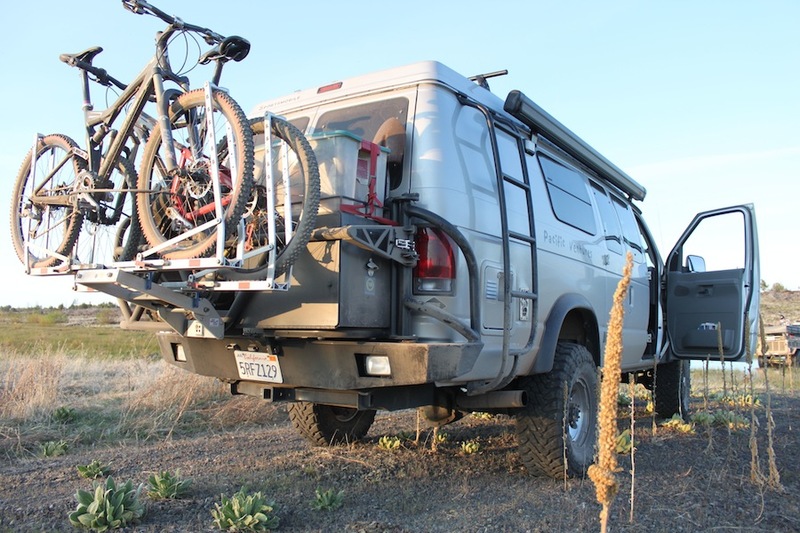 My first inclination is to get a hitch-mount rack and use my front bumper's receiver to mount the bikes up front. I like this because adding length to the rear of an EB with an Aluminess bumper, tire carrier and cargo box seems like a bad idea. Should I worry about blocking airflow to the engine if the bikes are up front? We have mountain/street hybrid bikes that are not so fancy. Any rack suggestions? Tray-style vs. hanging? i guess we need more info to give you a real solution. what kind of bikes? what kind of terrain will you be driving to ride said bikes? and whats your budget for a rack? for myself, i dont like carrying my bikes on top or in front of our vehicles cause i dont like the bug splatter. however, if your only doing short, close trips, those options arent bad. i use our roof mount a lot (on our civic), but rarely get up to highway speeds with it. being in back has a different set of issues. offroad, the bikes get a layer of moondust. not a terrible thing and better than bug splatter, but either way you get something dirty on your bike. if its all pavement, on back is the way to go hands down. rack style is going to also be a personal preference. for our civic i prefer the keep our bike in trays where front wheel stays on and rack grips down tube and has ratchet straps through wheels so bikes are ready to use upon getting to destination. ive used this style since around 91 with zero issues. roof of van isnt an option for me, but ive seen many setups on peoples vans where it looked handy on the back. 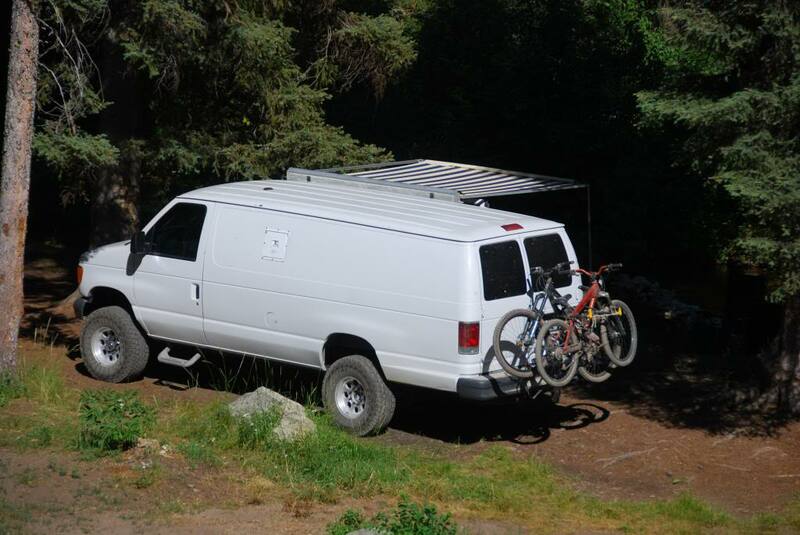 right now, i am using a 75 dollar craigslist rack made by hollywood that holds 4 bikes hanging on the van. depending on your bike, the hang style carriers can be hit or miss as well as so many bikes have completely different shock configurations. so that style will depend on your bikes designs. i like it cause it gets the bikes up off the ground so they dont drag on steep departures. since its only a 75 dollar rack, it doesnt hurt my feelers when i drag it on the ground. If you go with a rear rack, spend the extra $$ and get a swing-away version. The tilt-down racks are ok, but are hard to use and still block the rear doors. We use a Thule swing-away rack where the bikes hang from the arms. We can carry up to four bikes on it, and it easily swings away whenever we want to get into the rear of the van (which is often when camping). We've used racks on both the front and rear of the van (we have front/rear receivers hitches), and I like them on the back way more. Not only the bug issues, but also wind-driven rain and other crud sandblasting the bikes at 65mph on the highway. They still get dirty on the back, but not nearly as bad. We have an EB Ford with a step bumper, but not the full-on Aluminess setup with all the goodies, so I can't speak to how well it would work with that setup. There are other robust threads on the forum about this topic, search on some keywords and you'll find tons of info. I have not had cooling problems with bikes up front, whether the pedal kind of the motorized kind. Definitely go with Tray-style if you think there's a chance any of you will step up into a bigger bikes someday. Most down-hill and even some cross-country full-suspension bikes don't carry well on the arm-style racks. I like Yakima racks. Thule makes good racks for carrying bikes, but sometimes are lacking on the security department. This one is still in my garage - waiting for you !! You're welcome to check it out - anytime. UC Irvine area. I second that!! I love my 1upUSA. Can you tell me more about how it is attached to the cargo box arm? I don't see that option on the 1upUSA website.